Collector figuredue to popular demand, dc direct offers fans another chance to own an updated version of the sold-out superman 13"deluxe collector figure! 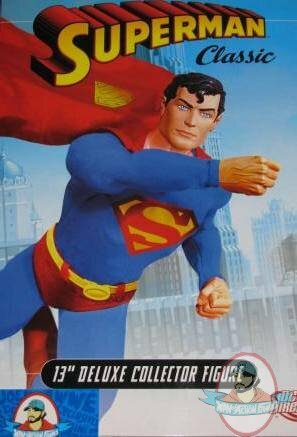 This 1:6-scale figure sports a brand new head sculpt, longer cape, and other costume modifications.Please note that this new edition of the superman 13"figure does not include the clark kent secret identity change of clothing. This re-issue does include a display stand, an extra set of hands and a bendable"steel"girder. This figure is packaged in a deluxe 4-color window box with fifth panel.